Achievements are a way of showing a players accomplishments and milestones throughout the game. 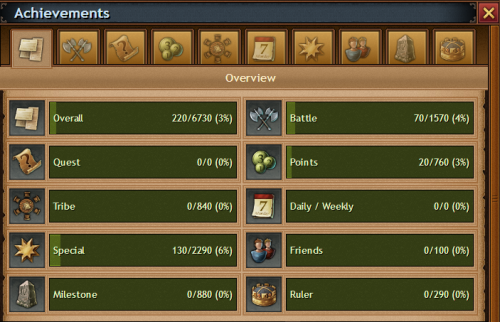 Achievements measure your performance and growth within Tribal Wars 2 and can be found in different areas of the game. Each achievement gives a number of "Achievement points" that can be seen on every player's profile. Achievements are awarded to you by the game for meeting certain criteria, which i.e. could be reaching a specific point level, using the market a number of times or plundering a specific amount of resources. The overview page shows your current progress on every achievement category there is. You can see how many points you currently have, and what the maximum number of points is. By pressing on one of the categories, you are taken to the specific category. This section shows the last 5 achievements you have accomplished. By pressing on one of the icons you are taken to the respective achievement, and it's progress is displayed. You can compare your own achievements against another player's achievements. This can be done by going to a player's profile and pressing compare. 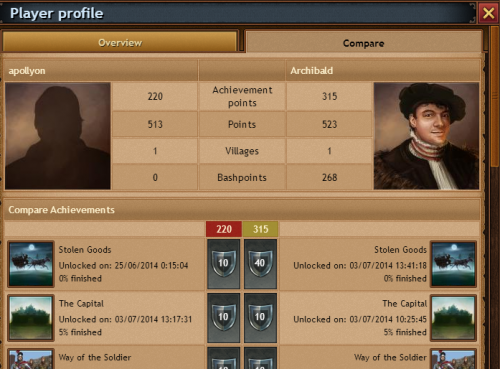 At the top of this screen you see your (on the left) and the selected player's (on the right) achievement points, player points, villages, bashpoints, as well as the number of achievements which can be found under the player information. In the comparing section you have a general overview of the achievements the other players have achieved compared to yourself. This page was last modified on 28 August 2014, at 08:54.